Forum › Software › Software/Firmware Feature Suggestions for Reolink! This topic contains 5 replies, has 4 voices, and was last updated by Steven Kan 4 months ago. I’m using my spiffy new RLC-423S as a BeeCam! Live stream is here, when the ffmpeg relay station is working. Allow lower resolutions via cropping. For example the BeeCam is at its maximum optical zoom right now, but for some scenes I’d like to take a center crop of 1920 x 1080 and “zoom” in even further. Include a built-in way to push the stream to a YouTube streaming channel. Right now I’m using a Raspberry Pi3 as an ffmpeg “relay station” to pull from the camera and push it to YT. ./ffmpeg -re -thread_queue_size 512 -rtsp_transport tcp -i "rtsp://user:password@192.168.1.121:554" -i SomeMusic.mp3 -vcodec copy -acodec copy -t 01:00:00 -f flv "rtmp://a.rtmp.youtube.com/live2/my-youtube-streaming-key"
That script does no decoding or re-encoding. The “-vcodec copy -acodec copy” just takes the stream, muxes it with the music, repackages it in “flv” format, and pushes it back out. It consumes << 10% CPU on a Raspberry Pi3 with a 700 MHz ARM. I had to download and compile ffmpeg for the Pi, but Reolink can probably to this with just a few lines of firmware code on the camera, because it’s just repacking the video stream that’s already been processed. 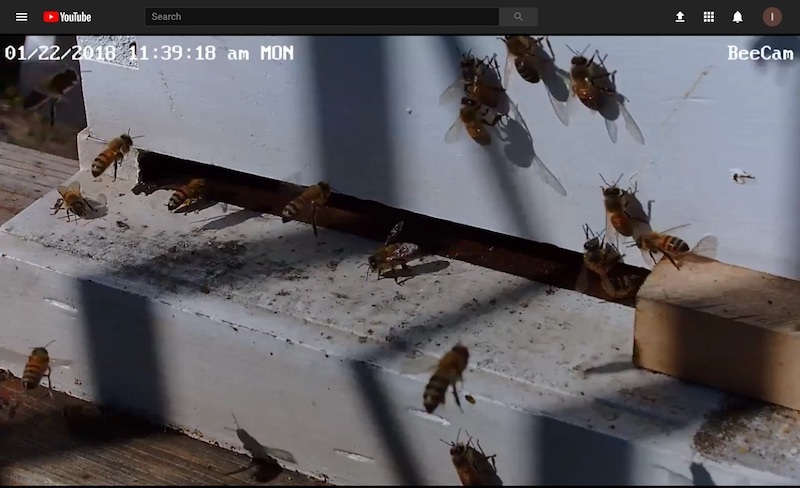 I have 4 Locations set up on the camera to look at Hive 1, Hive 2, etc. There’s no way to allow YouTube visitors to Call a Location, and I don’t want to give anyone direct access to my camera, even as a Normal user. It would be nice to be able to set up a custom URL, such as http://mycamera.dyndns.org/control/OneTimeKeyGeneratedByReolinkApp/PTZLocation1, or something like that, to allow a public user to select the view. This topic was modified 1 year, 3 months ago by Steven Kan. The auto focus on the PTZ is horrid to say the least. When I set up a Cruise Path it typically consists of 8 to 10 locations at varying focal ranges. The camera already takes significant time to get in the general area of focus when you zoom in or out for each location. That part probably cant be helped much. However once it gets in the general focus area, it hunts back and forth, passing optimal focus several times before locking in. The mechanics of the lens should allow for setting the camera to manually focus so the user can set focus for each location. That would at least do away with the time consuming focus hunt. I agree that saving the focus point as a part of each preset would be a very nice feature to add. Yes. Thank you very much for sharing. This is a very handy “recipe” that could come in handy in the future. Allow lower resolutions via pixel binning, such as 1920 x 1080. I’m going to reiterate this request. I’m trying to use a Raspberry Pi to put the RTSP stream from the RLC-423 directly out to a TV via HDMI, but the maximum resolution that the Pi can handle 1920 x 1080. The software (omxplayer) simply can’t handle anything larger than that. There is no down-sampling option in the Pi because the decoding is done in hardware, and that hardware is limited to 1920 x 1080. Doing the downsampling in software, via something like ffmpeg, won’t work on a Pi because there’s not enough computing power.